OK – Don’t Forget the Pets | Season It Already! Posted on May 23, 2013 by Carrie @ Season It Already! 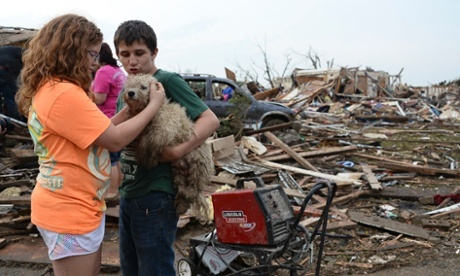 My heart goes out to all of those affected by the Oklahoma tornado disaster. I can even begin to imagine how horrific this past week has been for them. The residents of Moore, Oklahoma need our help. And if you haven’t already, please do your part in donating in any way that you can. While everyone affected by the tornado needs help, I would like to remind you all not to forget about the pets. When a disaster hits, they are often overlooked. When Katrina hit New Orleans and its environs, some pets were walking around in the rubble which created splinters, cuts and infections in their poor paws! I wish I personally could help all the poor animals who have suffered through this tragedy. If you haven’t already seen this video that has gone viral, you need to take the three minutes to watch it. It’s absolutely incredible. Please watch it first because I’m going to talk about it in a bit. Then there’s the story of a dog that guarded its owners body. You can read about that here. Unfortunately, not everyone is reunited with their pets or owners. Many of these displaced animals that are now missing owners need medical and everyday care. Petflow.com, a pet food delivery website, is offering free shipping when you send food to the listed Oklahoma Shelters, no matter how small the order is. If you choose to spend $55 or more, you will also get 10% off. The Pet Food Pantry of Oklahoma City‘s website is setup for immediate PayPal donations in which all donations benefit the tornado victims and their animals. The Animal Rescue Site is collecting donations for animals affected by tornadoes as well. I visit this site nearly every day because each day that I click means a bowl of food for an animal. There is also a store in which every purchase donates at least 14 bowls of food and even medical care for animals. I keep thinking about that TV crew person who saw Barbara Garcia’s dog while she was being interviewed in the video mentioned above. How did they possibly see her?! It was just her eyes peering out. Even when they zoomed in on the dog, she was difficult to spot. She was lying there in the rubble and crawled out without a sound after Barbara lifted some debris. How many other animals were traumatized that way and never found? I can’t imagine how hard it would be to search for family, friends or pets amidst the aftermath. So I ask, please help in any way that you can. Recovering from such a trauma can be an emotionally exhausting experience for people and pets alike. Give something you have so that they will once again have something, too. A great thing to shed a little light on, thanks Carrie!